A book that tells story of Australian charity Thankyou’s ‘start-up journey’ has sold almost 53,000 copies in six weeks, raising more than $1.4m for the charity. 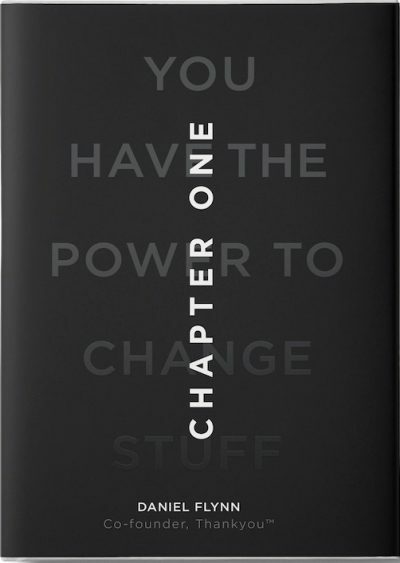 Chapter One: You Have the Power to Change Stuff by Thankyou co-founder Daniel Flynn was sold online and at LS Travel Retail at a ‘pay what you want price’ from 26 February, ahead of a broader distribution from 1 April. Distributor Dennis Jones said almost 40,000 copies of the book were sold prior to 1 April, which ‘would put it at the top of Bookscan if Bookscan recorded all sales instead of via “the panel”’. Many of the books were sold in bulk orders to companies such as the National Australia Bank and Optus, which each bought more than 1000 copies. For more information about the book, click here.